For the past 25 years, Los Angeles Neon + Cathode has enjoyed an excellent reputation for providing cold cathode lighting services throughout the United States. We are responsive to the requirements of lighting designers, architects, interior designers and lighting engineers. Our team background includes architecture, art, design and manufacturing and represents a level of quality and expertise unavailable from traditional neon and cold cathode companies. Many of our projects have been completed in association with nationally prominent architects and designers, and our work has been featured in numerous national trade publications and periodicals. Copyright © 2006-2015 Los Angeles Neon + Cathode. | Custom Website Design by The Design People, Inc. All Rights Reserved. Beverly Hills, CA One of the most beautiful Art Deco apartment complex in the United States is complimented by multi-colored Cold Cathode Lighting wrapping 18 individual penthouses. Los Angeles, CA A double row of custom-curved cold-cathode creates a dramatic glow to highlight this beautiful and functional circular ceiling system at Los Angeles International Airport. Architect: Wilkinson Architects A dramatic cobalt blue office space is created by installing Cold Cathode Lighting inside a glass enclosure. Malibu, CA A private residential application in Malibu, CA of dimmable cold-cathode highlights gentle architectural curves while providing a significant amount of low maintenance ambient light. Los Angeles, CA For the Petersen Automotive Museum, Los Angeles, the smaller diameter of neon allows for extremely tight free-form radius curves providing rich saturated colors and intense low maintenance light. Hollywood, CA For the Ramada Hotel in Hollywood, a single row of pastel pink cold-cathode beautifully accentuates the architectural facade and skylight, while providing a nearly maintenance free light source for difficult to access areas. 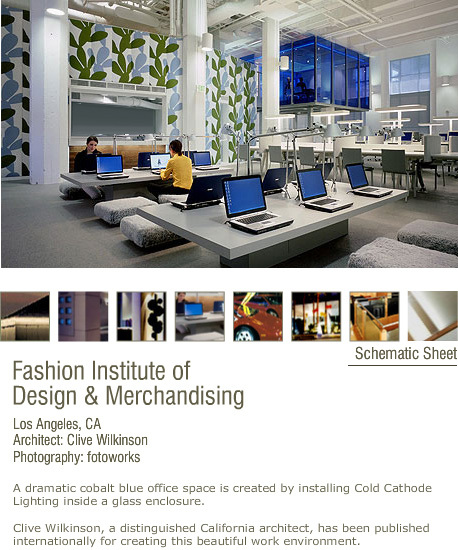 Architect: Mackler Echt + Associates, Inc. For Coast Business Credit, Santa Monica, one row of dimmable cold-cathode creates a continuous glow along the edges of these light coves. The architect was afforded a choice of ten different shades of white, from warm to cool. Architect: Mackler Echt + Associates, Inc. Utilized a combination of Cold Cathode Light and materials to create an award-winning corporate environment.